What wisdom, what sacred intelligence lay rooted within the soil and with all of the forest community? What guidance might I receive from Creator through the meant-for-ness of this place? This is what I sought after as I made ready for time away in the woods. Its important to note that this practice is not just all prayers and serene postures; it is just as much about play! So, with this invitation to play in mind, I found a little treehouse I could book and play I did! Simply climbing up into the holding and nesting branches of the tree that held my lodging reminded me of my child-self. Equal to the wisdom sought in the interconnections of the Spring season; Eastern cardinal direction; and the element of Fire (correspondences which find their alignment within the ancient Celtic tradition), was the curiosity of my child-guide. I have discovered that this internalized version of my girlhood-self has become a guiding voice that speaks to me in the way that she so longed to be spoken to so many years ago. It is her that says, "Climb that tree! It will be fun and you are strong and brave and can do it!" She is also the one that deeply remembers the transformative power of the woods, for she is the one who drank the nourishing milk of the faerie tales and myths and reminds me of their powers. So, I followed her when she excitedly invited me into the transformative power of the trees with the rallying cry, "Into the woods!" For three days I was immersed within the folds of the forest. I stayed within a little treehouse at Tree House Point. Unbeknownst to me, there is quite a following of this place due to its popularity gained through a reality television series on tree houses. So, when I was asked at registration if I was there because I was a fan of the TV show, I said no, "I'm here on a rewilding retreat!" I think we all were refreshed by new perspectives! In spite of its niche popularity and fan base, this was the perfect location to lean into the glory and magnificence of this particular bioregion. These themes of emergence are strong within the sacred meanings within these associations and invite one into a soulful journey that leaves the hearth and home of the Winter Quadrant; this quadrant is an invitation into the powerful transformational qualities of the forest, the location where all the nature symbols become embodied. This is the landscape where conversion occurs and those childhood faerie stories began to work their magic on me once again. Within their mossy and tendrilled tales were characters who were transformed by the woods and all who they encountered there. I was in need of renewal, the imaginal, the creative force that sparks up new life. Within this forest I would find the flame of sacred inspiration! I took long walks in the woods, these wanderings inviting solitude and aloneness. This time was completely different than being lonely or alienated from everything else. This was a time to allow my senses to tune in to the relationships that surrounded all of me fostering connection. For beneath me was the vast networks of mycelia, roots reaching to form familial connections that pass nourishment, information, and care along. Above me were the family trees: branches and trunks that told of storied and wise mothers, offspring, and the deep desire to be and behold. And all around me was the feeling of literally being transfused with veriditas, the greening power of God. This bioregion began working its deep and rooted truths on me. Within the wooded canopy you stay with questions, not the quick answers. Its not about racing through the trees to a finish line for there is no straight forward way in the woods. These timbered halls echo with the meaning of the journey, offering circuitous paths and passages, the wandering the value, the walking revealing universal truths. An authentic life will not travel the well-worn road traveled by many. Here a different worth is weighed. Eco-spirituality writer Mary Reynolds Thompson talks bout how the forest teaches that "No longer is expediency, efficiency, and uniformity most prized." Rather, here in the the wild our soul awakens to the creative impulse and power that resides within the Spirit of a place, "a place that thrums and thrives with creativity, authenticity, and diversity." Once one begins the journey of wild soul discovery, there is a distinct divergence from popular paths; the trailhead allures and assures of something more, something deeper, something transformative. An authentic life leads to the woods and one's metaphorical red cape and basket of goods for Granny become the very things that ensure radical change. Beside all of this vibrancy and evidence of new life there appeared a shadow-side. There was a demand to remember the past that cut and clawed, crushing the indigenous life that flourished here for thousands of years before white European settlers laid their severe and severing claim. Beside every second generation old growth tree was the old growth one that was cut down, viewed only for its value as a resource; seen not as something sacred, but as a storehouse of wealth and power. I felt deep sorrow for the ancient groves that no longer stood and grief for the leveled and logged life, felled by the axe and saw. Hear me well, I did not move through these woods with disdained judgment and pious partisanship. No, this was a tension I held and attempted to stay in. A tension held between two poles, one hand holding the pole of indigenous wisdom and traditions, and the other the pole of Western modernity and capitalist claims of unlimited growth. Between these two places, within this tension, is the high seat of Spirit, that holy presence that can look to the past with discernment and empathic wisdom and to the future with a hope for flourishing and regenerativity. By staying present to both the past and the possibility, I felt I was able to tap into the place, growing roots that tapped into listening to the sacred and holy intelligence of this forestscape, leaning into the historic complexity of the recent history here too. My hope became an enflamed imagination for what this second growth forest could be if allowed to grow undisturbed for 200 years, allowing the tree canopy to grow and increasing in biodiversity. The nurse logs and decaying stumps, while evidence of a slaying, also are the nourishing sites for life! 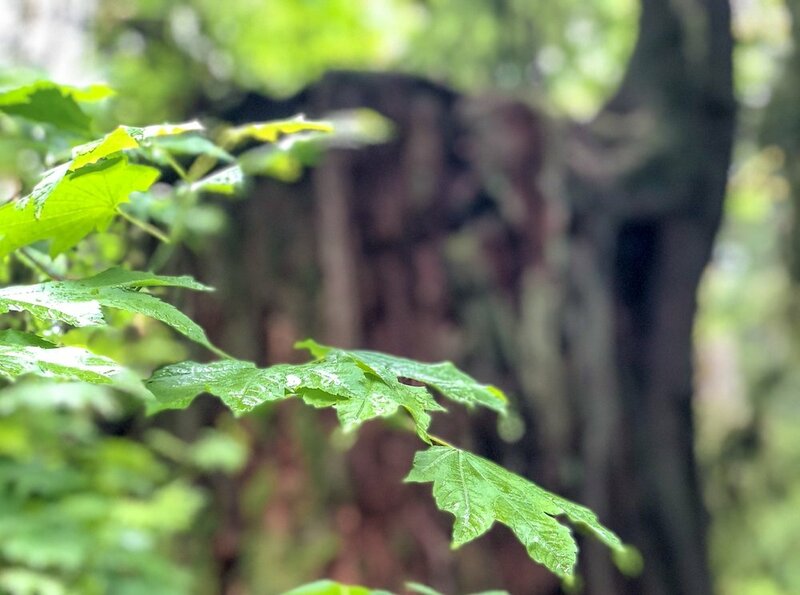 I traveled through the forest valley, created and carved by the ancient presence of the lower Snoqualmie River, which cascades in a flurry of 276 feet of sacred force known as the Snoqualmie Falls. Snoqualmie Falls is a nationally significant cultural site of great spiritual importance to the Snoqualmie Tribe, whose people traditionally inhabited this valley, hunting wildlife and collecting plants and fish. For the Snoqualmie Tribe (sdukʷalbixʷ), the significance of Snoqualmie Falls can be understood through the cosmological legend of Moon the Transformer. The story was recorded by anthropologist Arthur C. Ballard (1876-1962) in the early 19th century, as related to him by Snoqualmie Charile (sia'txted) (b. ca. 1850). This story was formed from this place, the earth manifesting into language and legend in unique particularity. Confronting the violent history of conquering colonialism comes unbidden as the commercializing of this sacred falls into a utility and recreational source cannot be ignored. This is complex and intersectional, I understand. However, what happens when we strip away the sacredness of the Earth is a removal of personhood, the essence that gives a being rights, voice, and story. I'm not advocating for appropriation of indigenous stories; I am asking that we learn from these stories that percolated up from this landscape. Listening to the numinous within native tales is to give the land its tongue again, and then it is our work to listen and learn from her language. We weren't placed on the earth, we emerged out of the earth. Indigenous cosmologies, creation origin stories, emphasize the interrelatedness between our natality and the nourishing and numinous topographies of Earth. The Hebrew Bible creation story within Genesis chapter two is no different. Even in this indigenous Christian myth there is an explicit connection to humanity being formed of the earth: "then the Lord God formed man from the dust of the ground, and breathed into his nostrils the breath of life; and the man became a living being" (Genesis 2:7 New Revised Standard Version). This is not mere dust, this is humus, the nutrient rich dark soil created when leaf litter (duft) covers a forest floor, creating a thick layer of humus. In addition to the plant material in leaf litter, humus is composed of decaying animals, such as insects, and other organisms, such as mushrooms. These ancient myths capture something of vital importance: the landscape is our ancestor, our kin. Mary Reynolds Thompson says it this way, "Four billion years of Earth's wisdom are embedded in your cells. It is time to awaken to the whole magnificent geography of your soul." We are formed out of the earth and our bodily composition mirrors the interrelatedness. Not only do our physical forms find mirroring traits and characteristics of the earth, but we discover that these topographies image something of our soul too. Ecotheologian and cultural historian Thomas Berry says, "Beyond our genetic coding, we need to go to the earth, as the source from when we came, and ask for her guidance, for the earth carries the psychic structure as well as the physical form of every living being upon the planet." (Dream of the Earth, 195). There is a psycho-spiritual connection we feel in various landscapes. This resonance informs where we are actually from (our own indigenous heritage); what may be the location of our current soul formation; and it may also inform an inner-landscape that is our actual soulscape, our inner nature that mirrors features of the outer world, or outer nature. Within this sacred and soulful ground is where we and Earth meet, expressing ourselves to one another and offering amplification for one another as well. The forest not only teaches me not only about itself, but even more about me. There is an inherent connection between not only our physical bodies and the earth, but also our psyches. These bioregions restore lost or exiled aspects of ourselves and in the rediscovery of ourselves, in our re-membing of ourselves to Living Earth and the great community of things who make up life on this planet, we begin to participate in restoring the earth as well. Within the 140 pages of the Waymarkers Rewilding Workbook, you will find many invitations to prayers, practices, rites and rituals that will assist in your tuning into the natural world. This sacred setting is no less than our soul's resonance with the natural rhythms and seasonal movements found within the natural world. I find that as every new quadrant of the Rewilding Wheel begins, I am more than ready to learn and lean into the lessons contained within the corresponding bioregion. This Spring I delighted in all things Fire, Forest, and Flowering. It truly felt like the embers of the anima mundi were catching the tinder of the forest duft, sparking my creative imagination and inspiring me to walk into the metaphorical woods, wandering into the mythopoetic text of transformation. There have been many new ideas that have been birthed in this season, sacred life being formed that will begin to take on shape in the requisite work and production time of the Summer quadrant of the Rewilding Wheel. I look forward to sharing these in the season to come! Following are a few of the personal practices I engaged with to deepen the forest mood in me, and cultivate a daily awareness of how this particular landscape expresses the Holy and becomes a sacred messenger as well. With the sacred symbolism of Fire within this Eastern Springtime quadrant, I wanted to play with fire this season. I engaged the challenge of learning how to make fire with a bow-drill, an ancient fire-starting method that is more about relationship and rhythm than ever even getting a fire started. Again, even in this act, I was learning about how this season and bioregion is about holding the question not rushing towards the answer. My son, an eager and natural carver, willingly assisted me with the creation of the bow-drill. We are grateful to the good folk at Taproot Magazine who provided a very helpful and meaningful tutorial on this practice. A thread that binds together the energy of the Fire and the Forest is found within the idea of inspiration. Forests help the world breath, and they have the capacity to inspire us as well, a word that comes from the Latin spiritus-breath. We use our breath to bring an ember to life and to live as a flame. We talk about a spark lighting up our imagination. Both the imagination and inspiration are the fertile ground in which new ideas emerge, a forest floor full of seed life and nourishing root systems, awaiting the light of the most primal life force, the sun, to awaken it and it bring it into form. Within the forest we witness the universal truth that we rise only when rooted. By bringing these seasonal and nature symbologies together into a bioregion, the Rewilding Wheel, the sacred circuit that guides these practices, aims to reroot oneself back into the rhythms, wisdom, and patterns that create this planet and our own flesh, feelings and ways to connect to the Sacred. This past season I loved the sensual experience of cedar. By infusing my lava stone amber necklace every morning with cedar essential oil, I was offering myself the blessings of the trees. This scent carried itself with me all day so no matter where I was, I had an unconscious connection and access to the health benefits of being within the forest. I would even add a drop to my face cream ensuring that I was anointed with this woodland oil! I also would light a tea candle in my essential oil diffuser (this copper oil diffuser is the one I use daily for my morning rituals), adding cedawood oil while facing East, saying prayers of gratitude for the emergence of a new day and for that great big flaming fire ball that is the origin of all life. It really became a favorite time of the day to gather in my senses and orient them to this season and bioregion and attune my senses to how God speaks through these elements. Creator God who makes yourself known through the tall and resilient strength of the cedar tree, bless to me this day. May my life be like medicine to those who are hurting, nourishment to those who are hungry, and warmth to those who may need shelter and clothing. May I grow rooted in your wisdom, like the cedar grows rooted in the soil, so that I too may rise within your strength. Amen. Drinking delicious cups of fir tip or source tea became another meaningful ritual this past Spring. Bright lime green and tender needles burst with new life and amazing nutrients, truly what my body appeared to be desiring after the cold and dark winter. This cup of liquid vitamin C and electrolytes was medicine for the Coast Salish peoples, and is still enjoyed today for its vibrant characteristics. There are many ways to enjoy fresh fir or spruce tips, but truly mine was in a steaming cup of water with lime and my dad's honey. I am fortunate that I'm able to forage these tips locally within my homescape, and I hope that you too can engage in this practice that demands a knowing relationship with your forest friends. Please do forage responsibly and honorably; do no harvest tips from trees that have been sprayed or treated with herbicides and honorably harvest with a deep sense of gratitude and reciprocity. Take the time to introduce yourself to the tree and express gratitude for the gift of food and medicine she is providing. You can prepare a hot tea by taking a handful of spring tips per 3-4 cups of boiled water. Cover and let steep about 10 minutes. Add lime (or even a stick of cinnamon!) and honey to taste.